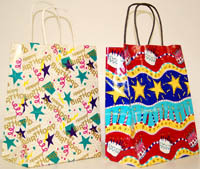 Birthday Paper Gift Bags with fun and colorful prints. Fill your giftbag with shred or tissue paper to top off your gift bag package. Gift Bags are 8 x 10 inches.